Surprise your little one with this cute teddybear! You can make it in no time with a few scraps of fabric! You’ll find our manual here. 1. Trace the pattern onto a piece of paper and cut out all the pattern pieces. Attach the head and body along the dotted line. 2. Fold the fabric in half. Pin the pattern pieces to the matching fabrics. Cut 2 pieces out for the bear’s body, 4 for the arms & legs, and 4 for the ears. 3. Lay both pieces of fabric down so that the right sides match exactly. Sew at 0.5 cm from the edge, but leave an opening for the filling. Thin the corners using the scissors and reverse to the right side. Fill sparingly because the ears, arms, and legs must remain flexible. 4. Embroider the eyes using a backstitch as indicated on the pattern. Embroider the nose. Embroider the whiskers using a French knot. 5. Lay both pieces of the body down so that the right sides match exactly. 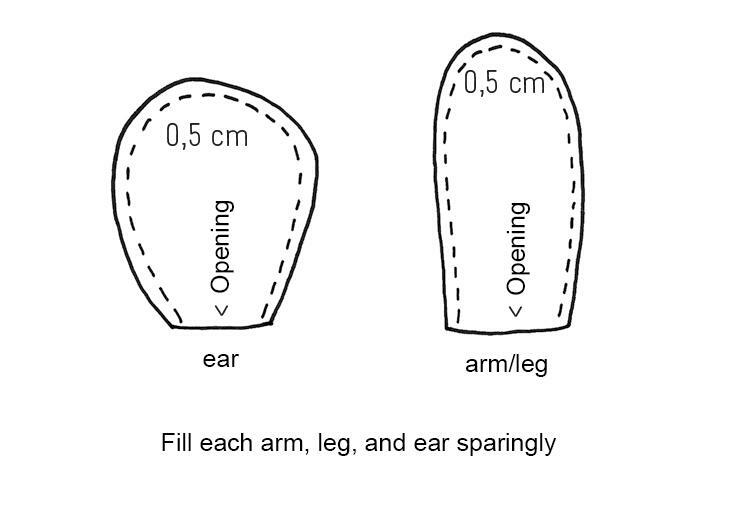 Slide the arms, legs, and ears between the two layers of fabric and pin into place. Sew around the body at 0.5 cm from the edge, but leave an opening in the side for the filling. 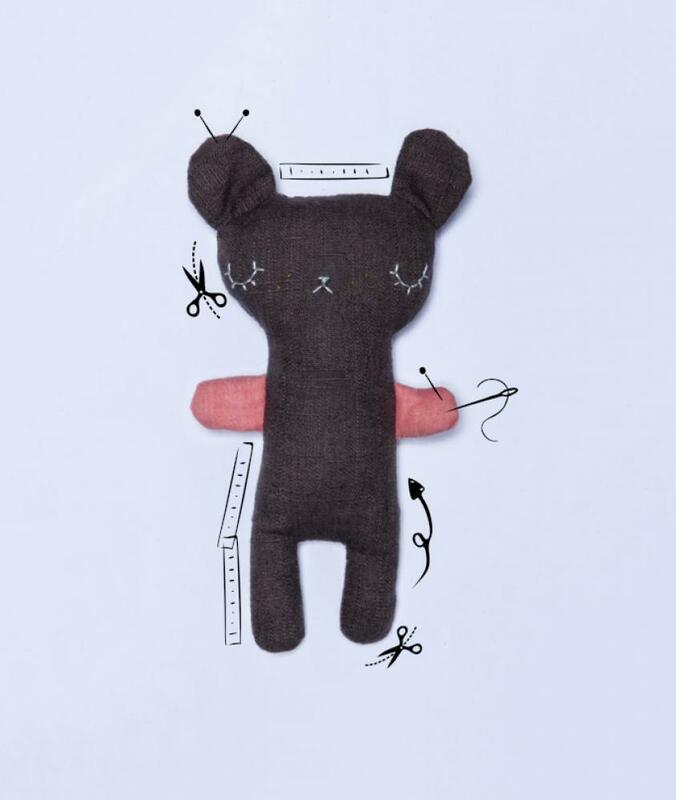 Thin the rounded corners using the scissors and reverse the teddy bear to the right side. 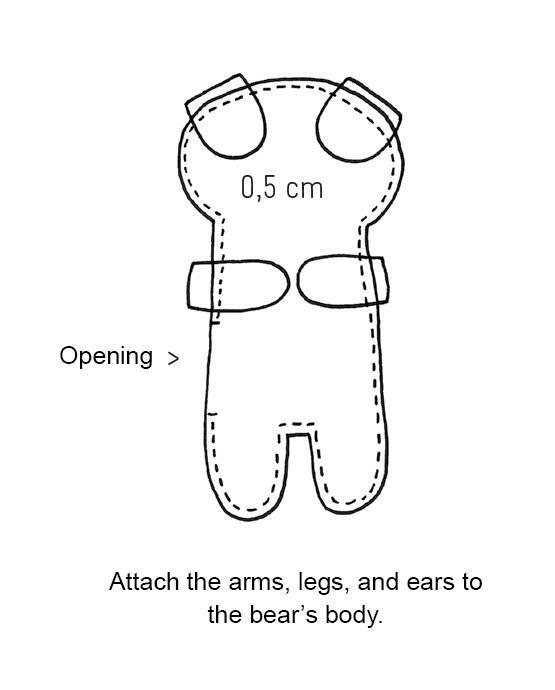 Fill the teddy bear up and then sew the opening closed using a hidden stitch.